The Union Navy was the United States Navy (USN) during the American Civil War, when it fought the Confederate States Navy (CSN). The term is sometimes used carelessly to include vessels of war used on the rivers of the interior while they were under the control of the United States Army, also called the Union Army. 1. Maintain the blockade of Confederate ports by restraining all blockade runners; declared by President Lincoln on April 19, 1861, and continued until the end of the Rebellion. Even more significant than the increase in raw numbers was the variety of ship types that were represented, some of forms that had not been seen previously in naval war anywhere. The nature of the conflict, much of which took place in the interior of the continent or in rather shallow harbors along the coast, meant that vessels designed for use on the open seas were less useful than more specialized ships. To confront the forms of combat that came about, the federal government developed a new type of warship, the monitor, based on the original, USS Monitor. The U.S. Navy took over a class of armored river gunboats created for the U.S. Army, but designed by naval personnel, the Eads gunboats. So-called double-enders were produced to maneuver in the confined waters of the rivers and harbors. The Union Navy experimented with submarines before the Confederacy produced its famed CSS Hunley; the result, USS Alligator failed primarily because of lack of suitable targets. Building on Confederate designs, the Union Navy produced and used torpedo boats, small vessels that mounted spar torpedoes and were forerunners of both the modern torpedo and destroyer type of warship. The highest rank available to an U.S. naval officer when the war began was that of captain. The Confederate constitution provided for the rank of admiral, but it was to be awarded for valor in battle. No Confederate officer was made admiral until Franklin Buchanan was named such after the Battle of Hampton Roads. This created problems when many ships had to operate together, with no clearly established chain of command. Even worse, when the Navy worked with the Army in joint operations, the customary rank equivalency between the two services meant that the naval captain, equivalent to an army colonel, would always be inferior to every army general present. After the existing arrangement had been used for the first year of the war, the case was made that the interests of the nation would be better served by organizing the Navy along lines more like that of the Royal Navy of Great Britain. A set of officer ranks was established in the summer of 1862 that precisely matched the set of Army ranks. The most visible change was that henceforth some individuals would be designated commodore, rear admiral, vice admiral, and finally admiral, all new formal ranks, and equivalent to, respectively, brigadier general, major general, lieutenant general, and general. A doctrinal shift took place at the same time. Prior to the war, the United States Navy emphasized single-ship operations, but the nature of the conflict soon made use of whole fleets necessary. Already at the Battle of Port Royal (7 November 1861), 77 vessels, including 19 warships, were employed. This was the largest naval expedition that had ever sailed under the U.S. flag, but the record did not stand for long. 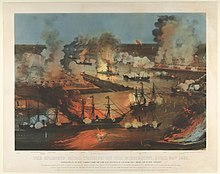 Subsequent operations at New Orleans, Mobile, and several positions in the interior confirmed the importance of large fleets in modern naval operations. During the war the Union Navy had a total of 84,415 personnel. The Union Navy suffered 6,233 total casualties with 4,523 deaths from all causes. 2,112 Union sailors were killed by enemy action and 2,411 died by disease or injury. The Union Navy suffered at least 1,710 personnel wounded in action, injured, or disabled by disease. The Union Navy started the war with 8,000 men, 7,600 enlisted men of all ratings and some 1,200 commissioned officers. The number of hands in the Union Navy grew five times its original strength at the war's outbreak. Most of these new hands were volunteers who desired to serve in the navy temporarily rather than make the navy a career as with many of the pre-war sailors. Most of these volunteers were rated as "Land's Men" by recruiters meaning they had little or no experience at sea in their civilian lives, although many sailors from the United States pre-war merchant marine joined the navy and they were often given higher ratings due to their background and experience. A key part of the Union Navy's recruiting efforts was the offer of higher pay than a volunteer for the Union Army would receive and the promise of greater freedom or the opportunity to see more of the country and world. When the Draft was introduced the Navy tried to recruit volunteers by offering service at sea as a better paying alternative to being drafted into the Army, this incentive was especially meant to attract professional sailors who could be drafted the same as any other civilian and would rather see combat in an environment they were more familiar with. The typical Union sailor was a hard, pragmatic, and cynical man who bore little patience for patriotism, reform, and religion. He drank too much, fought too much, and prayed too little. He preferred adventure to stability and went for quick and lucrative jobs rather than steady and slow employ under the tightening strictures of the new market economy. He was rough, dirty, and profane. Out of date before his time, he was aggressively masculine in a Northern society bent on gentling men. Overall, Union sailors proved less committed to emerging Northern values and were less ideological than soldiers for whom the broader issues of freedom, market success, and constitutional government proved constant touchstones during the war. For the most part, white sailors rejected contrabands as sailors. They did so owing to a tangled mix of racial prejudices, unflattering stereotypes that equated sailors with slaves, and working-class people's fears of blacks as labor competition. The combination of all of these tensions eventually triggered a social war—referred to as "frictions" by sailors—as whites racially harassed, sometimes violently, former slaves serving alongside them. Two early invasions of the South were meant primarily to improve the blockade, and then led to further actions. Following the capture of Cape Hatteras, much of eastern North Carolina was soon occupied by the Union Army. The easy success in North Carolina was not repeated after the seizure of Port Royal in South Carolina, as determined resistance prevented significant expansion of the beachhead there. Charleston did not fall until the last days of the war. The later capture of Fernandina, Florida, was intended from the start to provide a southern anchor for the Atlantic blockade. It led to the capture of Jacksonville and the southern sounds of Georgia, but this was not part of a larger scheme of conquest. It reflected mostly a decision by the Confederate government to retire from the coast, with the exception of a few major ports. Late in the war, Mobile Bay was taken by fleet action, but there was no immediate attempt to take Mobile itself. There were numerous small or one-to-one battles far away from the coasts between ocean-going Union vessels and blockade runners, often in the Caribbean but also in the Atlantic, the Battle of Cherbourg being the most famous example. ^ a b McPherson, James M.; Lamb, Brian (May 22, 1994). "James McPherson: What They Fought For, 1861-1865". Booknotes. C-SPAN. Archived from the original on March 9, 2016. Retrieved March 9, 2016. About 180,000 black soldiers and an estimated 10,000 black sailors fought in the Union Army and Navy, all of them in late 1862 or later, except for some blacks who enrolled in the Navy earlier. ^ a b Loewen, James W. (2007). "John Brown and Abraham Lincoln". Lies My Teacher Told Me: Everything Your American History Textbook Got Wrong. New York: The New Press. p. 189. ISBN 978-1-56584-100-0. OCLC 29877812. Retrieved January 19, 2016. ^ a b Hanna, C. W. African American recipients of the Medal of Honor. p. 3. Note: Hanna includes Clement Dees in his count, while this list does not, because Dees's medal was rescinded. ^ Soley, The blockade and the cruisers, Appendix A. The number of ships in commission should probably be reduced to 41, as one vessel, sloop USS Levant, had left Hawaii on 18 September 1860, bound for Aspinwall (present-day Colon, Panama), and was never seen again. See DANFS. ^ Tucker, Blue and gray navies, p. 1. ^ Gibbons, Warships and naval battles of the Civil War, pp. 24–25. ^ Gibbons, Warships and naval battles of the Civil War, pp. 16–17. ^ Gibbons, Warships and naval battles of the Civil War, pp. 106–107. ^ Tucker, Blue and gray navies, pp. 267–268. ^ Tucker, Blue and gray navies, pp. 260–261. ^ Tucker, Blue and gray navies, p. 365. ^ "Sea or Line Officers, 1861-July 31, 1862". Retrieved 25 December 2018. ^ "Cont". Retrieved 25 December 2018. ^ "Sea or Line Officers, July 31, 1862-January 28, 1864". Retrieved 25 December 2018. ^ US Navy (23 August 2017). "Uniform Regulations, 1866". Naval History and Heritage Command. Retrieved 30 December 2018. ^ "Line Officers, January 28, 1864-1866". Retrieved 25 December 2018. ^ Soley, The blockade and the cruisers,, pp. 1–6. ^ By the same token, in combined operations with foreign fleets, no U.S. captain could command if a foreign admiral was present, no matter what the composition of the fleet. This was a purely hypothetical problem in the nineteenth century, as the United States did not ally itself with any foreign powers at that time. ^ Soley, The Blockade and the cruisers, pp. 6–8. ^ The principle of service equivalence is now so strongly established that it was applied without any particular thought when the additional ranks of General of the Army and Fleet Admiral were introduced at the same time following World War II. ^ Browning, Success is all that was expected, pp. 23–42. ^ Tucker, Blue and gray navies, pp. 2–3. ^ Leland, Anne and Mari-Jana Oboroceanu. American War and Military Operations Casualties: Lists and Statistics Washington, DC, Congressional Research Service, February 26, 2010. Retrieved April 24, 2014. p. 2. ^ Michael J. Bennett, “Dissenters from the American Mood: Why Men Became Yankee Sailors During the Civil War.” North & South (2005) 8#2: 12–21. ^ Michael J. Bennett (2005). Union Jacks: Yankee Sailors in the Civil War. U of North Carolina Press. p. x. ^ ""Medal of Honor Recipients"". “US Army Center of Military History”. ^ Civil War naval chronology, p. I-9. ^ Wise, Lifeline of the Confederacy, pp. 221–226. ^ Tucker, Blue and gray navies, p. 4. ^ Tucker, Blue and gray navies, p. 150. ^ Browning, From Cape Charles to Cape Fear, pp. 27–36. ^ Tucker, Blue and gray navies, p. 255. ^ Browning, the success is all that was expected, pp. 66–73. ^ Dufour, The night the war was lost, pp. 59–70. ^ Browning, From Cape Charles to Cape Fear, pp. 293–297. Jones, Virgil Carrington, The Civil War at Sea (3 vols.) Holt, 1960--2. McPherson, James M. War on the Waters: The Union and Confederate Navies, 1861–1865 (University of North Carolina Press; 2012) 277 pages. Ramold, Steven J. Slaves, Sailors, Citizens: African Americans in the Union Navy (2007) .